Nepal’s Prime Minister Sushil Koirala is a ‘pauper’ in the cabinet of the richest ministers. 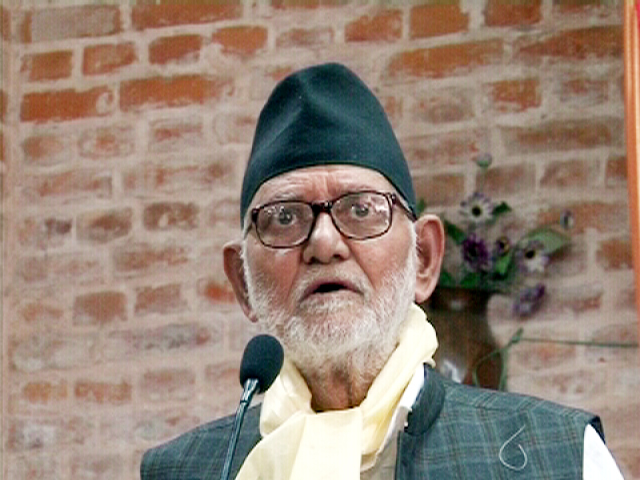 He is the fourth prime minister from the Koirala dynasty, yet, he owns no immovable property. His movable properties include just three set of mobile phones! 74 year old Koirala has no house in his name and has lived all his life in a shared accommodation. He has no bank account too and earlier this week he gave back his travel allowance of USD 650, which is equivalent to Nepali Rupees 63,427, to the country’s treasury! But the ministers in the cabinet he leads are not such modest. They are rich and qualify to compete for a place in the Forbes list. Bamdev Gautam, a communist and three times Home Minister, has properties worth more than few millions. He has booked a flat for rupees 50 lacs on his wife Tulsi’s name in Vegas City in Kathmandu. His daughter-in-law owns a 5 thousand square feet plot in an upmarket area of the capital city. He has also saved more than one crore rupees in his and son’s bank accounts. If calculated in market price, the minister’s property, which includes 350 grams of gold, can exceed 100 crore mark! Finance Minister Dr. Ram Sharan Mahat is a gold mine. Besides a two story house and a flat in the capital his property includes 950 grams of gold and 2 kg silver. Probably more than what the country produces through outdated placer mining technique every year! Both the ministers have proudly declared dowry received as one of their sources of income. Similarly, other ministers too have properties in millions of rupees. Education Minister Chitra Lekha Yadav has land and plots in 15 places including Lalitpur and Kathmandu. She also has 88 lac rupees in her bank account. Chitra Lekha is closely followed by Infrastructure Minister Bimalendra Nidhi, 600 gram gold and 45 lac cash, and Forest Minister Mahesh Acharya 450 gram gold and 65 lacs in cash. Other ministers too have equal or more property. In austerity, Sushil Koirala outscores not only his cabinet colleagues but also all the former prime ministers of Republic Nepal. Incidentally, all his predecessors were communists. Although, Jhala Nath Khanal and Madhav Kumar Nepal of the UML held long experience of the parliamentary democracy but other two, Prachanda and Baburam Bhattarai of the UCPNM, had criticized parliamentary politics for more than two decades. And yet as soon as they came to power they did exactly what they said they stand against. Prachanda was nicknamed Rado Comrade for he wore Rado watch and had a great taste for suits and ties. Later, he discovered enthusiasm for Helicopters. During election campaigns in November he would fly to the distances as near as 35 kilometers! Post People’s War, Prachanda lives in a house which he has rented for more than one lac rupees per month! In his party meeting he is often criticized for his luxurious lifestyle. Once his son Prakash Dahal went for the Everest expedition for which government of Nepal ‘donated’ 2 crores. Baburam Bhattarai was never directly blamed on any charge related to financial dishonesty but during his stint as the prime minister his wife Hasila Yami was often in news for wrong reasons. She was accused of financial dishonesty and favoritism. Once Matrika Yadav, a comrade in arms turned foe, had famously said, ‘Baburam Bhattarai eats his food with a spoon’. In this period of leadership crunch, Sushil Koirala’s modesty has given Nepali people a leader who they can relate to. But Nepal needs more than an ascetic. He has to prove that he can lead his country out of the crisis it is stuck in for long. The first Constituent Assembly (CA) failed to give a new constitution and second is moving nowhere. First three months of the second CA went without a proper sitting. The important issues are still unresolved and there seems to be no consensus among parties on these. The second big challenge he faces is to bring Kiran led Communist Party of Nepal- Maoist in negotiating table. Without doing so it will not be possible to guarantee real peace in Nepal. Although Nepal is a Left majority country, nevertheless, it always works well when it is led by the Right. Call it an irony, Nepal’s Left has always needed a supporting Right to move ahead. This is exactly what people want from Sushil Koirala. This entry was posted on May 13, 2014 at 7:30 am	and is filed under Nepal. Tagged: Nepal, Nepali Congress, Sushil Koirala, Vishnu Sharma. You can follow any responses to this entry through the RSS 2.0 feed. You can leave a response, or trackback from your own site.